Just like other years, the members of the Trip Committee had been working their asses off to organize an all-inclusive trip. But unlike other years, this trip was more than a bus ride away. 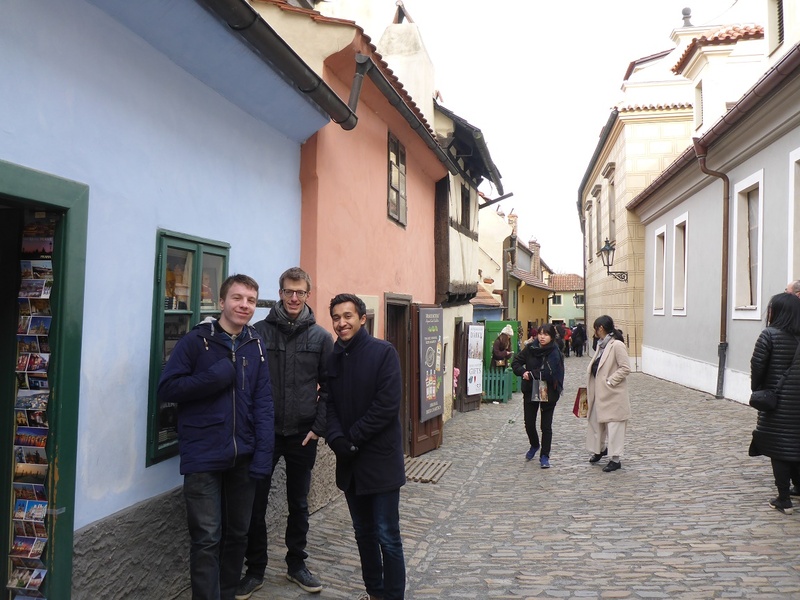 This time, we travelled with a group of thirty econometricians to the beautiful (but also extremely cold) capital of the Czech Republic: Prague! Thursday, 04.45 hours in the morning. At this impossible time we were supposed to meet on campus. Consequently, people were tired, grumpy or still drunk. This resulted in not everyone making it in time. When the last person arrived, we were ready to get on the bus for our first stop: Eindhoven Airport. Due to slight miscalculations of the Trip Committee in combination with the working mentality of some employees at the airport, we were only just in time for departure. By the time everyone was more or less awake, we had already landed in Prague where we took the bus and subway to get to our hostel. 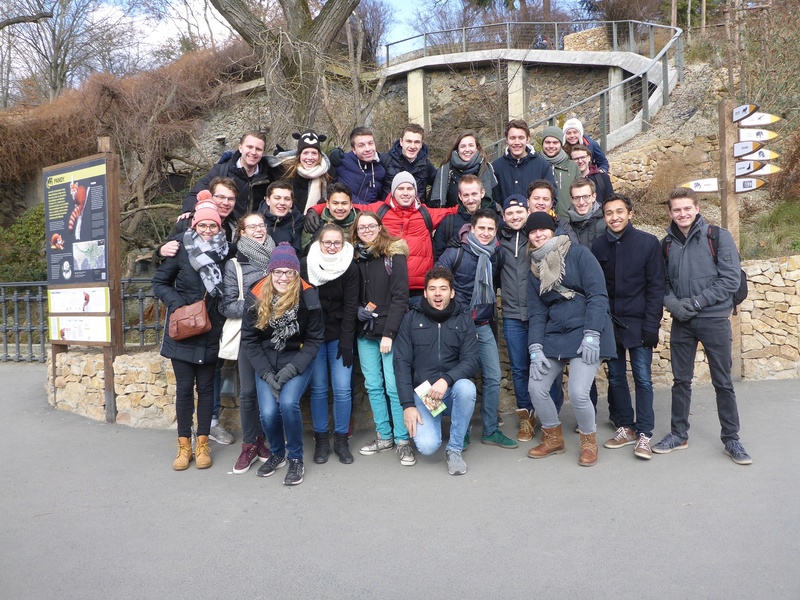 When we were all settled in our rooms, we got ready to start the first activity: the city tour! We were led by a Czech gentleman, who showed us several famous places, such as the main square and the longest shopping street of Prague. 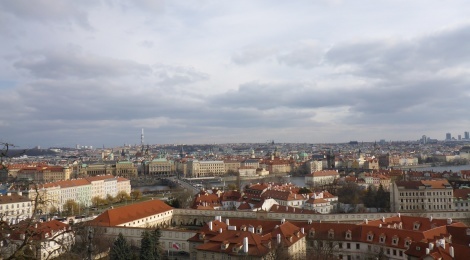 During these stops, we were told about the rich history of Prague and its surrounding areas, known as Bohemia. After a small break, we had the choice to continue the tour or to discover the city a bit more on our own. After some relaxing in the hostel, we went to the Beer Museum! First, we were able to learn and see things about the process of making beer, such as trying old machines and tasting the actual ingredients, like hop and malt. We then went to the more important part: drinking beers! We had four different beers, which were all great. Afterwards, most of us went to the hostel to rest. In the evening we went for dinner in a small and cozy restaurant, where we had hamburgers. The first day ended in the hostel, since everyone was really tired. The next morning, everyone was well-rested and ready for a brand new day. After having breakfast in the hostel, we departed for Therezín: a small ghetto nearby Prague, where a lot of Jews used to live. We first visited the ghetto museum, which had an exhibition about the transport of the many Jews who were departed to concentration and working camps during the Second World War. This was really impressive to see, because it made you realize the amount of lives that were lost during this period. Afterwards we went to the small fortress, also located in Terezín. This place was used to imprison people, such as the Jews in WWII, but also people like Gavrilo Princip, the assassin of Archduke Franz Ferdinand. After a tour by our own guide, we went back to the ghetto. Here, our guide showed us things like the cemetery as well as a crematorium, but also old buildings people used to live in. After this very impressive but long and cold day, we headed back to Prague. Back in the hostel, we rested in order to prepare for a long night of partying and drinking: the pub crawl! After having dinner on our own, we were ready for a wild night. Led by our host Axel and his colleagues, we went to four different bars and clubs. To be honest, the great memories shared and made in this night are all a bit fuzzy, but definitely proof of an exceptional night. Day three was again a busy day. Most of us were pretty hungover, which resulted in the programme having to be delayed by an hour. Around noon we started our journey to the Prague Castle. It took quite some time to get there, since a lot of stairs had to be climbed to reach the stronghold. Once we arrived, we had a beautiful view over Prague. We also had a look inside the castle, which was beautiful as well. After dinner, everyone got ready for another long night. We started the evening with a ghost tour. A British girl took us to several places in the city and told us about old legends and spooky stories. Although it was a very fun and scary experience, everyone was really cold and wanted to go inside. That’s why we were glad once finally entering the karaoke bar! We sang a lot of classic songs as well as recent ones, while enjoying some beverages. The one who deserves a special mention is Jon, who definitely stole the show during the night with his voice and performance! Day four! A bit tired and sick, but with a good mood, we went ice skating to get rid of our hangover. Even though some were better than others (Stephan for example…), we had a good time on the ice rink and beautiful pictures were taken. After this physically intense activity, we had lunch in order to gain strength back . It was then time for my personal highlight of the trip: driving through Prague on a beer bike! After splitting up the group in two, we were ready to ride the bike. Through the streets and alleys of Prague, we had a number of beers and sang the greatest songs while trying our hardest to get around on the bike. There were a lot of hills and slopes, which meant we had to pedal extra hard. A lot of other tourists made pictures of us, which was strange but also funny to see. Unfortunately, after an hour and a half we had to get off the bike and continue our way on foot. Most of us went for some lunch and others focused on getting to the hostel as quick as possible. In the evening we went to our favourite bar Double Trouble. Since it was the last evening, some people decided to peak, especially Bernard! What a night that was! On the last day, we woke up pretty early to pack our stuff. After having breakfast, we had to check out from the hostel. But we were not done yet, since we were going to the zoo of Prague! This zoo is one of the largest in Europe with every kind of animals you could think of. We first took a photo of the entire group, in order to create a lasting memory of the amazing time we already had together. After visiting the elephants, tigers, lions and weird-looking fish, we returned to the city centre to have our last dinner together. Then, we picked up our luggage at the hostel and headed for the airport. When we arrived at the airport, it quickly became clear we were going to have a long night at the airport: our flight was delayed by three hours. In addition to that, we had to fly to Amsterdam instead of Eindhoven. Nonetheless, we had a lot of fun at the airport playing games and listening to music. After a quick flight and two bus trips, we finally arrived in Tilburg. Sadly enough, the trip was over! A special thanks to the Trip Committee, who realized this great trip! I also want to thank the entire group, each and every one of you are fantastic people. It was a blast!